Your 50th anniversary music for your party needs to be chosen depending on the ages of your guests and the music tastes of your couple. Music from the 1950s and 1960s will need to be popular, there is little point playing obscure songs that only a few people know as you want everyone to feel relaxed and maybe get up and dance. You can find compilation albums specific to 1950s and 1960s which would make providing the music easier and then you could add in your anniversary couples favorite music from the last 50 years. Are they big into country, folk, blues, jazz or even big ands? If you have a mixture of ages coming to the party then it would be a good idea to have a few classic party songs that guarantee everyone will get up and dance. You will also need background music to play during the party , you could have a cd of love songs or ask all the musically talented members of the family and friends to provide some of the entertainment. They may only need to do one song or play for a short period if you have lots of volunteers! There are a number of music sites that are a great resource to put together a playlist for your party. These 2 we have used ourselves and find them great. Spotify - We have been at a party where one person was in charge of the laptop and then they played DJ all night taking requests! It did work really well as there was a number of different age groups. 8 Tracks - a personal favorite that has lots of playlists that loads of people have put together. You can choose what you want to listen to either by the type of music you want to listen to - instrumental, classical, jazz, pop. Or by the year. Or even music to cook to, bath to - all sorts really! 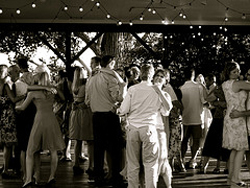 If your party is going to be big it will be worth hiring a dj or a band, they know how to work a party so that everyone leaves having had a good time.